So I thought it best I should probably give a more detailed picture on what I think thriving means. 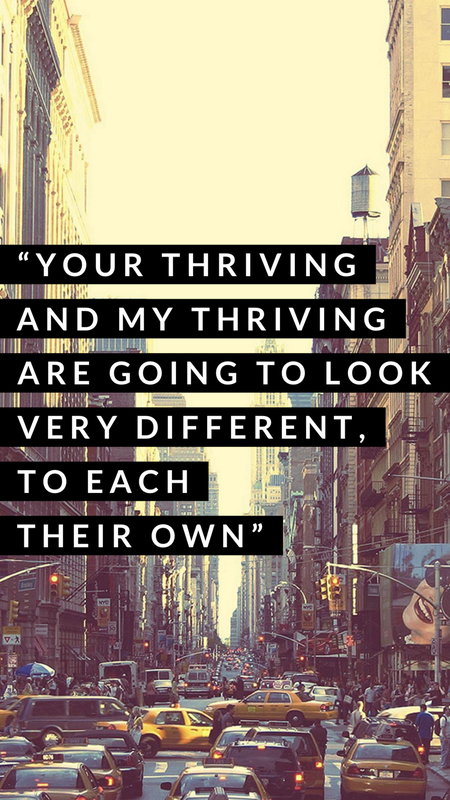 Now your thriving, and my thriving are going to look very different. To each their own. Neither is better or worse, we’re all just trying to make our own joy out there. Some of these are inspired by thing’s Ive heard on some of the other podcast’s I listen to, the actual list part of this is connected to the 100 Things by Sebastian Terry. So far I’ve only been able to think of 47 things that I really want to do in my life…. but I’ll make additions to this list as I go. Ok So 2 things, while this is written as a list - dominated by items that dont/wont be done by the time I’m 30, I want to mention that Thriving is a feeling. It’s about feeling full in life. You aren’t bogged down with the kinds of worry around money or living situations. I’m not saying it means you’re life is perfect by any means, or that you’ve done all you have set out to do but Thriving means feeling alive. It still mean’s hustling for what you want, but not having to slog through the trenches of money issues means that hustle might be more of a run. If you listed to episode 3, you probably heard me ask Sarah “What do you want your thirties to feel like?” Now you can replace thirties with - forties, or twenties, or 2019, or life in general. My list is like a half specific time half non specific. Anyway - yeah so - what do you want them to feel like? What do you enjoy right now that you want to expand on? Or is there something that has been bugging you that you’d like to address. Try and come up with three things. Security - like for me the number one feeling I want to get rid of is worry connected to money. And so as you’ll notice with my goals like alot has to do with getting rid of debt and saving. I’m so tired of living paycheck to paycheck - and I mean that literally. Like having less than $30 to get you through more than a week. And I’ll name like scarcity feels different to everyone - which is particularly connected to your socio economic status - but If I’m being real - about 80% of the people I know have no idea what living below the poverty line looks or feels like. Me and my mom call it “living skinny”. But the other side of security for me is this sense of “I know who I am” and the part i really want to pay attetion to is “I know what I want” I want my thirties to feel secure in their purpose. Like I’m not changing my plans for the future every week. But that my 30s are secure in the general direction of feeling secure - possibly even settled. Inspired - I mean this in relation to my art, Like I am coming to terms with the fact that I like having about 3-5 projects going on at once. Like Ive got 2 main ones - The first is a series of Paintings based on my dads photos. The second is a much slower project in that right now I only have sketches and one painting that I started - its about like the desirability of trans masculinity - about coming to terms with what it means to be sexual or intimate as a trans man attracted to men - and coming to love the skin I’m in and this unconventional masculine body. Yeah so two very big - or what I envision being long term projects. But I have big goals about things I want to happen with my art in my 30s. In like new media to explore - like photography - getting into shows and just feeling that ignition around making and creating without burning out, like remembering to pace myself and not put a whole lot of pressure on myself about deadlines, like If I end up being ready for that deadline ok, great, if not, there are other shows and there is always next year - this is about sustaining my drive to make long term - I’ll know when it’s time to apply to a solo show. Until then, just make at my own pace - and under my own standards of what is or isnt good. Connected - Maybe this is the neglected Social Aquarius in me but my 20s were like really isolated- like the further into my 20s i have gotten the less people I have around me, in terms of friends/support. It really was like 2015 when I last lived near my friends. So obviously I need to work on making more connections to people who are physically near me. I’d also like to not like just disappear from doing family things either, if that makes sense. - ive got some big ideas about what to add to my list in terms of that priority. Like going to gallery shows and literally taking myself out to different places around the city and just experience things. Sign up for artists stuff in the area. I also want to feel more connected in a spiritual way, like taking a yoga class or a meditation something. I also have this really strong urge to go see a medium. I cant really put my finger on that one, Maybe A future episode. New Job - Finance 9-5, Nov 12, 2018. I will be in Florence, Italy. Run a Marathon - or maybe a half - or maybe bike - this is more about doing a race and training. Participate in the Annual National Portrait Gallery Exhibition Show. I’ll update this as I go along, adding things or marking things off from the list!